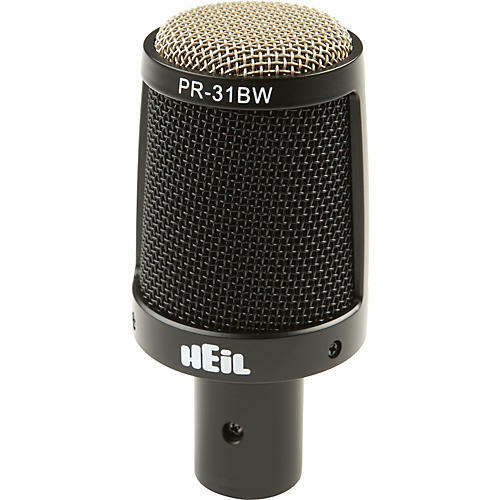 The Heil PR 31 BW was a suggestion of Bob Workman, FOH engineer for Charlie Daniels, who uses Heil microphones exclusively. Bob uses the Heil PR 30 for just about every application but it was too large physically to fit in and around the drum kit so Bob suggested Heil "cut it in half," and that's exactly what they did-and the Heil PR 31 BW was born-a 4" version of the PR 30 that exhibits all specs of the full-size PR 30. It has the same great frequency response, same wonderful front pattern, and the incredible -40 dB of rear and side rejection, which is perfect for using the PR 31 BW as an "underhead" microphone for cymbals. Placing a microphone under the cymbal has never been successful because the microphone hears everything around it. With the -40 dB of rear and side rejection of the PR 31 BW, the microphone does not hear anything but what it is point towards-in this case, the cymbal and nothing from the toms or other sounds close by.